As the Baby Boomer generation begins to age and the need for healthcare services increases, nursing looks to remain an in-demand career choice. The Pennsylvania Department of Labor & Industry projects a 25 percent growth rate for the employment of LPNs from 2012 to 2022 – faster than the average for all occupations. Across the state of Pennsylvania, community colleges, vocational schools and private career schools are answering the call, with an increased number of LPN programs available, often taking just one to two years to complete. Learn what programs and licensing entail, and begin the search for a school. With so many LPN programs offered in Pennsylvania’s community colleges and private schools, it can be challenging to narrow down the options. The following search tool can help prospective LPNs filter results based on their individual preferences. Compare schools side-by-side, and search by options like number of programs, school size and cost. Every state in the U.S. requires working vocational and practical nurses to hold a license, but the specific licensing process varies. The section below discusses the process applicants must follow to become licensed and maintain licensure in Pennsylvania. Applicants for licensure must have completed in one of the state-approved LPN programs in Pennsylvania. The program must include at least 1500 hours of instruction. Licensure for LPNs who attended an out-of-state nursing program must also have completed 1500 hours of instruction. In either case, if the program includes fewer hours, the applicant must make up the missing hours with additional training. First-time LPN license applicants must complete three hours of DHS-approved child abuse recognition and reporting training as a condition of licensure. 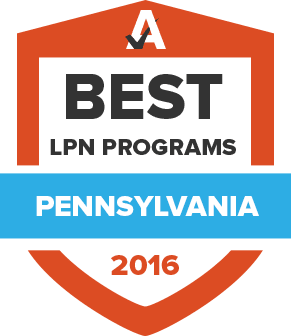 Applicants may complete this training prior to completing a LPN program in Pennsylvania. Pennsylvania is not a Nursing Licensure Compact state, which means it does not recognize licenses issued by other states. LPNs with out-of-state licenses must become licensed by the Pennsylvania State Board of Nursing in order to practice in the state. It is possible to begin practicing nursing after graduating from one of the many LPN programs in Pennsylvania-and while waiting to take the licensing exam-by obtaining a New Graduate Temporary Practice Permit (TPP). Nurses with a TPP must practice under the physical supervision of an experienced Pennsylvania registered nurse. Applying for a TPP requires the completion of a separate application (from the application for licensure). The TPP automatically expires as soon as the applicant takes the licensing exam. The nursing program attended must send applicable transcripts and a Nursing Education Form directly to the State Board. The Pennsylvania State Board of Nursing requires LPN licenses to be renewed every two years. Licenses expire June 30 of even-numbered years. There are no requirements for continuing education or proof of practice hours. Renewing an LPN license involves the submission of an online renewal form and payment of $60 by credit or debit card. Opportunities for LPNs in Pennsylvania abound, but some regions will have more openings and higher potential salaries than others. The tables below identify the areas of Pennsylvania with the highest LPN salaries. Projected growth for LPNs in Pennsylvania is 25% from 2012 to 2022, with many opportunities is settings such as nursing care facilities and hospitals, according to the Pennsylvania Department of Labor & Industry. Employment projections are spread almost equally among Pennsylvania’s largest counties, such as Luzerne-Schuylkill, Delaware, and Chester Counties. This LPN association provides continuing education opportunities, lobbying services, an annual convention for members across the country, including Pennsylvania. This member organization has represented the professional interests of all nurses, including Pennsylvania LPNs, for more than 100 years. Membership includes access to and savings on products and resources, including the journal Nursing Education Perspectives. Comprehensive information about the NCLEX-PN, the certification test nurses must take to become LPNs in Pennsylvania. A primary source from the Commonwealth of Pennsylvania for verifying LPN licenses. Frequently Asked Questions about LPN licensure from the Commonwealth of Pennsylvania State Board of Nursing. This organization represents administrators in Pennsylvania Practical Nursing programs and acts as a resource body for issues affecting the education of practical nurses. The Commonwealth of Pennsylvania State Board of Nursing regulates the licensure and practice of LPNs in the state. Online forms and instructions are available at this site. The Pennsylvania State Nurses Associations represents RNs and LPNs in the state. Members receive access to continuing education and networking opportunities.